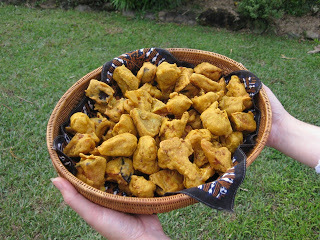 Pakoras – Indian spicy vegetable fritters. I am always eternally grateful to an old neighbour, Nalini, who taught me how to cook Indian food – particularly her regional cuisine from North India. I treasure her hand written recipes, that are over thirty years old, with this pakora recipe being one of my family’s favourites. This is a fantastic, tasty vegetarian/vegan snack with an added bonus – they are gluten free -you use chick pea flour for the batter. They are also cheap to make and highly nutritious. This is an extremely versatile recipe using many types of vegetables – whatever is in season really. Here I have used cauliflower and eggplant (aubergine) which are my particular favourites – the eggplant staying crispy on the outside but deliciously soft in the centre. You could also use; onion, potato, zucchini, pumpkin, sweet potato, broccoli, yakon, choko, okra, carrot etc. oil for frying (not olive oil) – I find rice bran the best – it has a high smoking point, doesn’t saturate the food you are frying and keeps the pakoras crispy. 1 tbs of whatever sweet chutney you have. 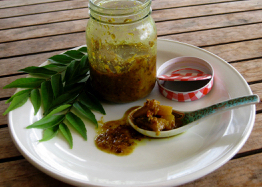 I use either my date and tamarind OR pineapple oil pickle. 1. In a large bowl, mix all the spices, besan flour, salt and water together to make a coating batter – it should neither be too runny or too thick. 2. Cut all the vegetables into even, bite-size pieces and toss them into the batter coating each piece. 3. Heat the oil until it is just smoking and try a piece of pakora to see if it is hot enough. Cook in batches until lightly golden and drain on kitchen paper. Best eaten warm on the same day that you have cooked them. 4. Mix the yoghurt and chutney together to make a dipping sauce. 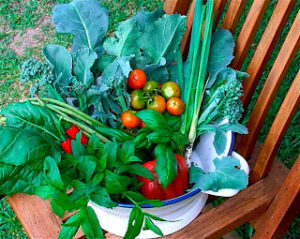 TIP – always dry the vegetables thoroughly before you chop them, after you have washed them, or the batter won’t stick.